He's an endoscopic doctor. He's a falconer. He's a vintage Porsche rallyist. He really might be the real-life 'most interesting man in the world', and he'd for sure give any other poseurs this side of Chuck Norris a run for their money. He's Dr. Erik Brandenburg. 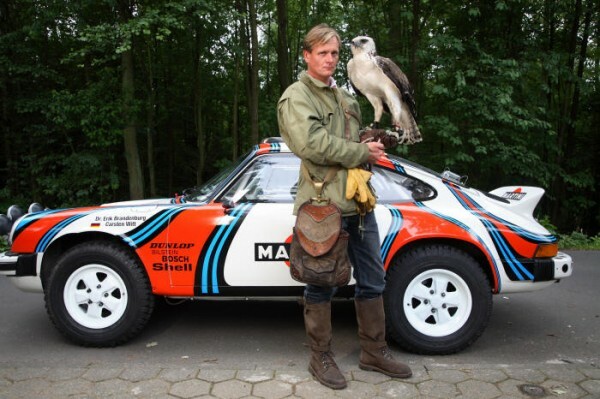 The good German doctor, in his spare time, runs a Martini-themed Porsche 911 in all kinds of historic and modern rallying events, including the Transsyberia Rally a number of times. Recently, Dr. Brandenburg picked up a new transporter for his rally car, a MAN that's been decked out in full period-correct Rothmans' livery. His cool quotient just keeps rising. Check out this quick video of Dr. B loading and unloading the rally Porsche onto and off of the MAN's covered rear deck. The 35 seconds of entertainment is certainly worth the click. In case you needed further convincing that Doctor Brandenburg is one of the Raddest Mothers to ever walk the face of this planet, here are another couple videos of Brandenburg doing his thing. First, he shows off a simple river crossing in his Safari 911. Next, he ups the ante, showing off his river crossing abilities in front of a few SUV drivers on the TransSyberia rally in 2007. Yep, he really is that cool!